Dark Souls: I finally finished it! After literally years of alternating between playing semi-obsessively and ignoring it for months, I have finally beaten Dark Souls. This grand achievement was a long time coming, and as it turns out, all you really need to beat Dark Souls is to be stubborn. I don’t remember exactly when I bought it, but I think it must have been early 2013. Long enough after release that it had been marked down to a mere $20. That really doesn’t narrow it down, as these days games can be reduced to less than that mere weeks after release, but you get the point. I played up to the first real boss (Taurus Demon), got frustrated, threw up my hands, and called it a wash. Months later, I related this experience to my younger brother, who had finished and enjoyed Dark Souls. He encouraged me to try some more, and even came over to serve as a sort of tour guide as I played. Normally I like to figure things out on my own, but I discovered that it was nice to get a helping hand in that early stage of the game where I was still coming to terms with how the game worked. From the Undead Parish on, I struck out on my own, though I kept the wiki just a bookmark away for those tough times. It was around then that I really fell into the Dark Souls groove, and came to truly adore the game. I played on like a madman, getting struck down by monsters at every turn, but never giving up, because I knew that every obstacle was surmountable with enough practice and persistence. Even Anor Londo, the area of the game which features two of the most notoriously difficult encounters, didn’t discourage me in my quest to conquer the game. Eventually, in February of 2014, some other game showed up and stole my attention (p sure it was Lightning Returns), leaving Dark Souls to fall by the wayside and be forgotten. Eventually I did return to it over a year later (mid-2015, for those keeping track), smiting the boss at which I had stopped (Demon Firesage), and besting the most poorly designed foe (Bed of Chaos) with a little bit of patience. While I did make my way down into the Tomb of the Giants, that’s where my quest was put on hiatus yet again. Why? Who knows? I probably got distracted by something shiny. Finally, last weekend, I decided that it was time to get back into Dark Souls. Long enough to get to the end, at least. Armed again with my brother as I guide, I began to progress though the remaining areas of the game at an incredible pace. I bested the last remaining bosses (Gravelord Nito and Seath the Scaleless) with little difficulty, and stepped into the final area: The Kiln of the First Flame. It was a gruelling, hours-long battle. 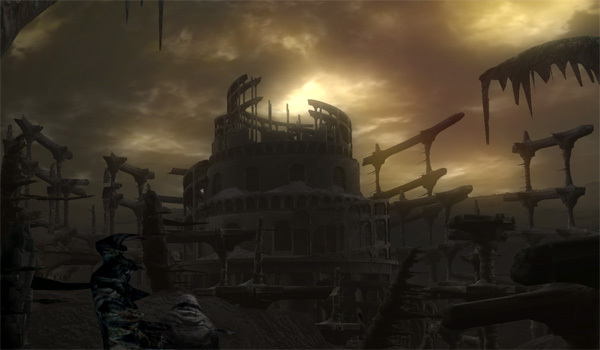 The Kiln is a very short area, host to only five knights and then Gwyn, the final boss. However, those knights are skilled and powerful. Trying to make a mad dash for the boss arena seemed like the best bet, but far too often I’d be slashed or skewered on the way there. Fighting the knights was a tricky proposition, as I had the skill to defeat them without taking a blow, but one wrong move could just as easily get me killed. Also, there was a giant chasm partway through that stupid me fell into on more than one occasion. Gwyn himself was a beast. Armed with a huge, flaming sword and rarely leaving an opening, it seemed impossibly difficult to get an attack in edgewise, and even harder to find a safe opportunity to heal. I fought him time after time, sometimes feeling like I was learning his patterns, and sometimes feeling like it was hopeless. In the end, the winning strategy was to farm rats for a pile of humanity to buff up Quelaag’s Furysword to unbelieveable levels, and summon Solaire as a meat shield. I wanted to defeat Gwyn in a one-on-one fight, but alas, it was not to be. In the end, I cried out in joy as the Lord of Cinder’s defeated form vanished into the air, and lit the nearby bonfire without realizing that I was choosing an ending while doing so. My journey was over, and finally I could rest easy, knowing that Dark Souls had been conquered. Of course, that’s not to say that I’m done with it. I love Dark Souls and eagerly await my chance to start up a New Game+, or better yet, to serve as a guide for someone else playing it for the first time. I have the protips now, and I would be simply delighted to be able to pass them on.